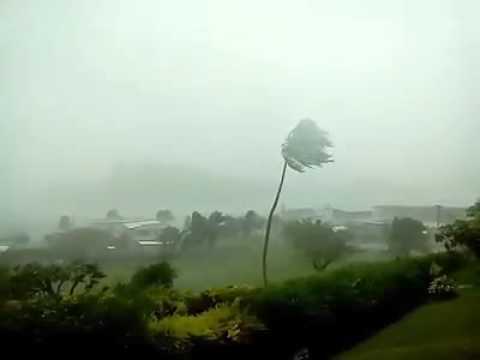 Fiji, TC Winston in Savusavu - Category 5! We have received requests for more pics so here are a few from today. This poor cat is high and dry with a big hole in her side. It’s on shore between Waitui Marina and the Copra Shed. We spoke to her owner today and they are going to epoxy plywood to her hull so she can sail to Denarau for repairs. He had 10 liters of resin in his checked bag. The other shot is my Fijian haircut today. What a mistake to arrive with hair – it’s like wearing a wool cap you can’t remove. The Mermaid cut it all off and my internal temp immediately dropped five degrees. Thanks babe! Tomorrow we provision up, bend on our genoa and go for a test sail. I went up the rig today and everything looks great. Ellie continues to impress as always. Boatwork, Fiji, TC Winston in Savusavu - Category 5! Bula Bula from Savusavu! We are aboard Ellie and after four exhausting days of repair and cleanup she is back to normal. There was some minor damage to the stainless bimini frame and of course the bimini canvas that was left up was torn pretty badly. We also had a dorade box lift up and pull some screws but I have already repaired it. The bimini canvas was re-stitched by a local and is already back on and looks great. All her systems are still in working order, fridge is ice cold, pumps all work, head works, fans work, outboards and generator started on first pull, and the engine purrs like a kitten! Our extensive preparations really paid off. Alyssa did an outstanding job attacking all the mold that was down below. Much to our surprise we cleaned enough the first day to sleep in the vberth that night. She labored away the next two days cleaning and stowing everything. We now have a livable boat again thanks to the Mermaids Herculean efforts. I spent the last couple days wedged under boats covered in mud and mosquitoes helping pull boats off the shore. I spent one day digging under boulders in the mud strapping lines around rocks to pull them out of the way so we can get a boat free. I also spent time freeing broken shrouds and disconnecting broken masts. It’s been saddening to see the plight of fellow sailors who had their only homes driven ashore in the storm. Most don’t have insurance and will be salvaging what they can to attempt to make their boat seaworthy once again. There is a lot of work ahead. We are in contact with Sea Mercy and are standing by to take supplies out to the outer islands that were hit hardest. As soon as they get supplies here we will sail them out to those in most need. Bruce and Jen on SKABENGA already delivered supplies to villages on Makogai. They are headed back here this evening. 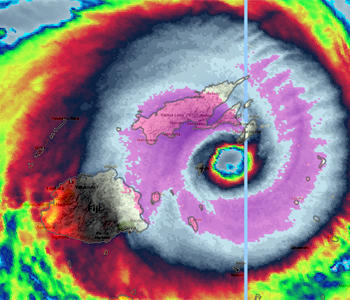 The death toll continues to rise as officials reach remote islands; the last count was 44. The damage is extensive and over 60,000 people are in evacuation centers after losing their homes and most of their possessions. It will take a while for the Fijians who were affected to rebuild their lives. Amazingly though the happy Fijians have not had their smiles wiped out with their homes and as we walk around town we are greeted with the same huge smiles and “bulas!” from the locals. It’s the resilient spirit and positive attitude that will see these wonderful people through this event. We’ll write again in a few days. Here are some pics of Ellie and some of the boats still ashore. Ellie is FINE! She Rode Out Category 5 TC Winston and SURVIVED!!!! We knew she was a tough boat and she proved herself in the 180 mph winds of TC Winston that tore through and devastated Savusavu this past weekend. We just heard from Jim on Hotspur that Hotspur is fine as well and that Ellie has minor damage but is OK and still on her mooring. We fly out tomorrow and will hopefully be back reunited with Ellie on Wednesday morning Fiji time (Tuesday am in the US). Our hearts go out to all those who lost family, friends, homes, boats, farms and livelihoods in this devastating storm. The pictures of entire villages flattened are horrific. We will do what we can to lend a hand and help out those Fijians who lost everything. We are headed back with medical supplies, food and water sanitation equipment. The Fijians are resilient and will pull through this stronger than before. We will help however we can. To those cruisers who lost their boats. We are devastated for you and will be there to help salvage what is left and float those who are able. There is no internet, phones or power in Savusavu but we will try and update everyone in a few days if possible. Thank you everyone for your support. We encourage you to please donate to the emergency services that are coming to Fiji’s aid in this terrible disaster. We have included the Red Cross and SeaMercy links below. Lewis & Alyssa are available for yacht deliveries anywhere in the world. You can trust us to get her there safely. Please visit the link below for full details of our experience, qualifications and references. We look forward to hearing from you! We’re Headed back to Fiji!! With Motorcycles and Big Dreams!! Bula Bula Amigos! Hope all is well out there. After a whirlwind four months in the States we have accomplished our primary mission of obtaining professional yachting qualifications so it’s high time to hop a flight back to the land of warm trades and warmer smiles! We are flying back to Fiji via Australia at the beginning of March and will be reunited with lonely Ellie. She is still doing well, albeit a bit lonely and perhaps a bit moldy as well. They sell bleach in Savusavu so I think we’ll be able to get ol’ Ellie girl cleaned up straight away. We are coming back with a few checked bags stuffed with much needed boat parts. Sailors in the states have no idea how spoiled they are with the abundance, selection and price of boat hardware and supplies. I’ll let West Marine know they should open a branch in Savusavu….not sure they’ll go for it though. In other news, the Pirate (Bruce) and I have concocted an awesome plan to get some adventure motorcycles back to Vanua Levu. I spent the past week buying two KLR650 dual-sport motorcycles, riding gear and a ton of spare parts, crating and shipping them. They are due to arrive in Suva, Fiji at the beginning of March. If all goes well we’ll be exploring hidden waterfalls and secluded white sand beaches with our new exploration vehicles! Stay tuned for some epic pictures and video! In other, other, significant news, we have potentially found some dirt to buy! You know how we said we loved Fiji so much we were never leaving….well we decided to make Fiji our home base, so we have found some Fijian dirt to call home. We are under contract to purchase an entire peninsula of waterfront land! We will be visiting the property straight-away upon our return and if all goes well we will be the proud owners of a Fijian peninsula in a few months! We bought some bug screens and rain fly’s for our hammocks so we can get to the property via motorcycle, string our hammocks and see what it would be like to live on our own private peninsula! Stay tuned for exciting pics and updates! Thanks to everyone who has been helping us. Allan and Rina for allowing squatters into their home. Ryan and Kristina for helping with the bike logistics. And the Pirate for taking care of Ellie and for funding the awesome bike endeavor! Hope all our sailing friends are doing well and living it up. We look forward to seeing everyone during the upcoming season. Take care and sail safe with fair winds and calm seas.